On 17 October 2016, Chinese police arrested and beat up a Tibetan monk, Lobsang Tsultrim, after he had staged a solo protest against China’s rule over Tibet in Sichuan’s Ngaba County. Mr Tsultrim has been admitted to a hospital with severe injuries. The monk belongs to Ngaba’s Kirti monastery, which has witnessed repeated self-immolations and other protests by monks and nuns opposed to Chinese rule in recent years. 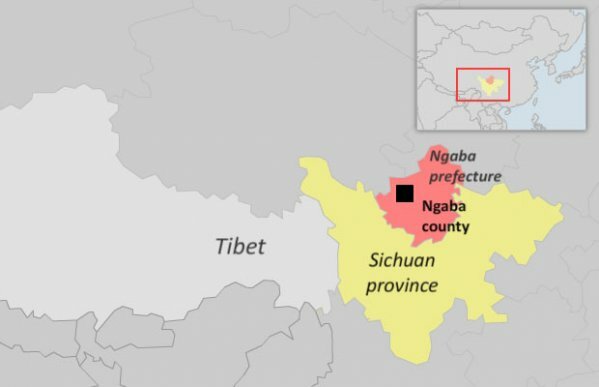 Chinese police in Sichuan’s Ngaba county detained and beat a Tibetan monk this week, leaving him hospitalized with severe injuries after he staged a solitary protest opposing Beijing’s rule in Tibetan areas, according to a local source. Lobsang Tsultrim, a monk in Ngaba (in Chinese, Aba) county’s Kirti monastery, was taken into custody at around 1:00 p.m. on Oct. 17  after shouting slogans while walking along a street in Ngaba county’s main town, a resident of the area told RFA’s Tibetan Service. “He called out for Tibetan freedom and for the long life of [exiled spiritual leader] the Dalai Lama as he walked, and when he arrived at the street in front of the Tibetan Language Middle School he was stopped by police and taken away,” RFA’s source said, speaking on condition of anonymity. Tsultrim was then severely beaten by police and held overnight at a court house in the town, the source said. “He was rushed to Ngaba Hospital the next day and is now reported to be in critical condition,” he said. On 18 October 2016, a group of Chinese police went to Kirti to question monks about the incident, and the presence of police and security officers has now been strengthened throughout the town, RFA’s source said. Ngaba’s Kirti monastery and the county’s main town have been the scene of repeated self-immolations and other protests in recent years by monks, former monks, and nuns opposed to Chinese rule.